Apex Technologies Limited based in Burnaby, BC, Canada was established in March 1997 by Bharat Bhagat and Robert Brudar. Apex began fully operating on April 1, 1997. From a small customer base with two CNC machines initially, the company has grown to serve a large variety of industries in BC and the USA, particularly in the hi-tech manufacturing field. Currently with ten CNC machines, Apex's capabilities range from custom to production machining. Apex Technologies Limited is a fully equipped sub-contract CNC machine shop with the latest CAD/CAM Technology, specializing in precision CNC Turning and CNC Milling. Apex is dedicated to provide its' customers with excellent quality products, competitive pricing, reliability and on-time delivery. 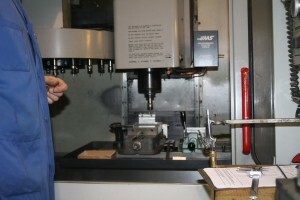 Due to our excellent service and reputation as one of the leading CNC machine shops in BC, Apex Technologies Limited is ISO 9001:2008 and Controlled Goods Program certified by the Federal Government, therefore you can be sure that parts will exceed standards and meet the CNC machining requirements of all its' customers. Apex owes its success to its loyal customers and its skilled workforce. The next time you have a requirement give Apex Technologies Limited a call. Give the most competitive prices for our customers to be successful. Provide excellent service to our customers. Have a skilled workforce to be part of a successful team.